Sunday June 18, 2017 Continued from the previous blog post: Well, the fog would periodically lift for a short while and then fill in as thick as ever, so we stayed aboard Tug’n most of the day, busying ourselves with odd chores amid phone calls with Happy Fathers’ Day wishes and wonderful smells of Fran’s cooking. Periodically we’d look for weather updates, but fog, higher winds and growing waves were all we could see in our near future. We launched our dinghy to join Bob and Jan on Wings for Happy Hour and later, a trip to the marina facilities for showers. Monday and Tuesday June 19 and 20, 2017: Not much change in the weather. On Monday, we had very strong winds through the harbour with quite a chop making us raise our dinghy every evening. Monday we spend a few hours doing more walking around Boothbay Harbour. We visited a gallery/shop with the most unique collection of things we’d never seen. We’re beyond the stage of wanting to collect more “stuff” but this shop really did have some tempting objects d’art begging to be held and purchased. Later, we managed to get reasonably close to the site of a rebuilding of a wooden schooner to take a few photos. It was a very impressive site and it is marvellous that the tradesmen skills for this type of work are still alive and well. It is hard to imagine the expense of such an endeavour. Wednesday is looking like our weather window to start moving further southwest along Maine’s coast as the forecast shows the winds subside and the waves are down to the 4 foot range. In the meantime, we’ve had very strong winds right through the harbour. Thankfully, the shape of the harbour has kept most of the wave action away from us. Wednesday June 21, 2017: Its the summer solstice (longest daylight hours of the year). Here the sun rose at 4:59am and it sets at 8:26pm - that’s 15 hours and 27 minutes. What a wonderful thing. Back at home in Oakville, Ontario sunrise today is at 5:38 and sunset at 9:03 for a total of 15 hours and 25 minutes. So we got an extra two minutes of daylight in Maine and we enjoyed every one of them. 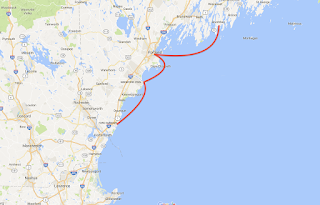 Today we cruised from Boothbay Harbour to Portland, Maine. We had a 10 to 15 knot breeze and 1.2 meter swells on our beam that were quite well spread out. The occasional swell was about 2 meters, but all in all, it was very comfortable. We saw far more lobster boats than pleasure craft, but the closer we got to Portland, the more pleasure craft we saw out on the water. Portland, with a population of almost 67,000 is Maine’s largest city. The Greater Portland Area has a population of over half a million people, more than one-third of Maine’s total population. Originally, the peninsula Portland is located on, was settled in 1632 as a fishing and trading village named Casco. When the Massachusetts Bay Colony took over Casco Bay in 1658, the town’s name changed to Falmouth. The town of Falmouth was destroyed multiple times in various conflicts. On October 18, 1775 in its final destruction, Falmouth was burned to the ground in the Revolution by the Royal Navy. Following its rebuilding, it was initially named The Neck and it began growing as a commercial port and shipping centre. In 1786, the citizens of the former area called Falmouth formed a separate town and named it Portland, after the Isle of Portland off the coast of Dorset, England. 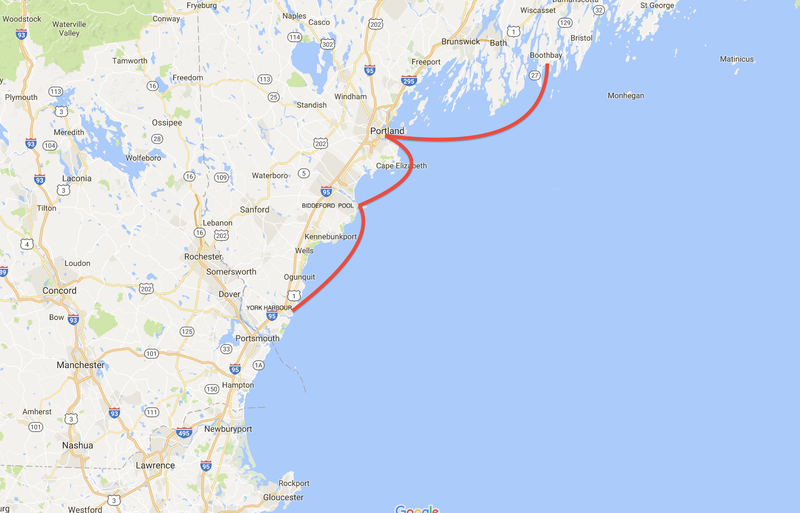 In 1820, when Maine became a state, Portland was its capital, but 12 years later the capital was noted north to Augusta. In 1851, Maine led the nation by passing the first state law prohibiting the sale of alcohol except for “medicinal, mechanical or manufacturing purposes”. In 1853, upon completion of the Grand Trunk Railway to Montreal, Portland became the primary ice-free winter seaport for Canadian exports and in the process became a significant railway hub and shipping port. Following nationalization of the Grand Trunk is system in 1923, Canadian export traffic was diverted from Portland to Halifax, Nova Scotia, causing a significant decline in the Portland economy. Portland’s “Old Port” area went through a major transformation in the 1970’s when developers bought up derelict buildings and refurbished them into apartments, condos, offices and retail space. The “Old Port Association” was formed and they helped halt the city’s demolition of historic buildings. The end result is a wonderful district with cobblestone streets, renovated 19th century historic buildings, restaurants, boutiques and offices. Today it is a magnet for people and tourists, boats, marinas, yacht clubs as well as commercial vessels and lobster boats. The Centerboard Yacht Club (CYC) was the most economical downtown choice for us on the South Portland side of the harbour. A terrific staff of young people operate the tenders to bring you ashore from the mooring ball. They kindly took us across the Fore River to Portland’s Old Port where we spend about three hours wandering the streets, window shopping and exploring. We had a desire for a hamburger for lunch and found a place (new to us) called Elevation Burgers. Their ads of grass fed beef, ground fresh on site and Peak Organic Beer won us over and it turned out to be an excellent choice. Later, we were repeat after an ice cream from Mount Desert Ice Cream. We met some lovely people at CYC in their lovely clubhouse, learning that the clubhouse was brand new this year. We can highly recommend the club with its reasonably well protected moorings and its great view of Portland across the narrow river. CYC Tender bringing us back from the "Old Port"
Thursday June 22nd, 2017: Bob & Jan weren’t with us last night. They needed to replace their dinghy as their old one, at 16 years, was past its “best before” date and multiple seams were failing. They’d ordered a new Zodiac from a dealer in Yarmouth, Maine and spend last night there, with a plan to meet the dealer this morning and make the switch. Hopefully we’ll meet up at the next stop. We woke up to a beautiful morning. The deck was covered with dew, which had dissolved all the dried salt spray from yesterday’s run. A rinse with our fresh water wash-down hose and a wipe made our decks, cabin and windows look and feel fresh again. We were underway by 0920 for Biddeford Pool or Wood Island Harbour. It was a picture perfect day on the water with a light 10 knot breeze from the SW plus a < 1 meter ocean swell from the south, which was all very comfortable (at least for cruising on the open ocean). We passed mostly lobster boats, one fishing trawler and a couple of pleasure craft and dramatically fewer lobster pot floats. Biddeford Pool is a reasonably well protected basin made by Wood Island, Stage Island and Fletcher Neck. Biddeford Pool Yacht Club is further in, through a narrow channel but we found the Pool to be suitably calm and chose to anchor there. It is a very pretty location with lovely homes around the perimeter and a large beach to the north. Here it feels like the boating season is well underway as sailboats and small fishing boats are coming and going regularly from the yacht club. Stage Island has an unusual cone shaped monument with an interesting story. There had been so many shipwrecks on Stage Island’s shallow waters, as the shoreline in this area was quite nondescript, so the government decided a “day mark” was needed as an aid to navigation. In 1825, they awarded the $1,200 contract to three Portland stone masons, specifying the tower be 60’ tall. It was to be built from stones blasted from the shores of Stage Island. The tower reached 54’ when tragedy struck. The foundation had not been built on solid stone and when it gave way, the tower collapsed killing one of the three contractors and injuring three other workmen. The remaining two contractors were held responsible to rebuild the tower at their own expense. The second tower was successful and once completed, it was painted white. Today, the white paint is long gone and it is no longer considered an aid to navigation. “Maybe it was 55 years ago I started in the Lobster business here, I operated the smack Etta B. Rich between here and Portland. There was no well in the craft but lobsters were so plentiful and the run was so short, we got along all right without one. I would frequently take from 600-800 lobsters in two or three hours that would average two pounds or more a piece. I also bought from other lobstermen. Maine’s lobster business really started here at the Pool. Uncle Frank Verrill began way back, he would fill an 18 foot boat to the gun-whales and he did not save a lobster that weighed less than 2 pounds. That was the smallest while most of them weighed 3 or 4 pounds. Today, the demand is for the one-pound nine inch (sic) Canadian lobsters which have almost ruined our fisherman and their markets. There used to be wonderful fishing right around the river mouth. The mackerel fleet all came in here, but it was the herring that made things hum. I have seen as high as 200 sail of herring fisherman anchored off there in Winter Harbor. The buyers used to speculate in herring just as one might in wheat or corn. Sometimes a big catch would change hands several times without being moved from the vessel. Fortunes were made and also lost in the business--Waldo Verrill"
Regulations have changed dramatically and lobstermen report they only keep about 1 in 10 lobsters from their traps due to the narrow size range they are allowed to harvest, plus no female lobsters are taken. Their strategy seems to be working as the industry is thriving and the lobsters are well fed and reproducing rapidly. However, an article sent to me by my friend Bob in Poland talks about changes to the timing of lobster moulting (shedding their shells as they grow) due to warming of the ocean and the author wonders whether the strong controls Maine has in place will be enough for the long term health of the lobster fishery. Later in the afternoon we launched our dinghy and explored the community of Biddeford Pool. We visited the yacht club, the local general store and did some beach combing at low tide while neighbourhood children with bathing suits on, played about in the shallow 14 degree C water. Bob and Jan aboard Wings made it to the harbour by 1830 hours having obtained their new dinghy. As the late day wind died down for a quite evening, we had brief discussions with Bob and Jan confirming plans to depart at 0730 tomorrow for York Harbour. Friday June 23, 2017: We were up and underway by 0730 with very light winds and a modestly rolling sea for our 25 nautical mile run from Biddeford to York Harbour. It was a pleasant and uneventful run with the highlight being passing a 102 Windjammer named SSV Harvey Gamage from Portland Maine. This schooner is dedicated to your programs on the water and she looked extremely well cared for. York Harbour has a narrow dog leg kind of entrance and we’d read during flood and ebb tides the current can run as much as 4.5 knots, so we timed our arrival at high tide and secured mooring balls from the town in the small basin. It is a very attractive harbour and both sides of the shoreline before the harbour and further on up the York River were lined with exquisite homes nestled among large trees with lovely landscaped properties. A very friendly harbour master came out to ensure we got safely secured to the mooring ball and to process our paperwork and collect our mooring fee. He also volunteered to drive one of us to Hanaford’s Grocery and as Jan had the longer list, she took him up on the offer and took Fran’s list to shop for us at the same time. Bob and Jan launched and successfully tested out their new dinghy but managed to get soaked in a fairly heavy downpour. After they dried off, the sun came out again and they joined us for happy hour as we discussed tonight and tomorrow’s weather and our destination options for tomorrow. What a night we had with the evening flood tide while moored in the York Harbour river. We faced the full brunt of the 4.5 knot current with both our boats swirling back and forth, often burying the mooring ball 1 1/2' below the water's surface. The force of the water was so strong, our prop shaft began spinning (free wheeling), which is not good as the shaft seal was not getting its usual water lubrication from the engine. To stop the free wheeling, after a few attempts I managed to get a line around one of the shaft coupler bolts and secured it to one of the very stout engine mounts. As the current continued to batter us, I regretted putting the mooring line over a bow cleat instead of the much heavier bollard. I set the alarm for 2330 hours, just after high tide, so we could relocate the mooring line making it more secure for the next flood tide beginning at dawn. In the morning, we learned Bob on Wings got up at 0230 hours as their mooring ball was banging against the side of their hull in the slack water. When up on the bow of Wings, he noticed our two boats were starting to swing together (stern to stern) and he dashed back to the cockpit and managed to separate them when they were only one foot apart. Then he lined the stern of their boat with fenders in case the two boats came together again. Two light houses from today. We love lighthouses!